Independent software developer Kylie Grant is on top of her game in the world of IT. She has loyal clients, a good reputation, and a prestigious membership in technology giant Afire Industries’ small business accelerator. Things are going well until she stumbles across an innocuous issue with the lighting in the building where she rents space. When she digs into the problem, she discovers something unexpected—a hack. The incursion doesn’t affect her, but Kylie leaves enough clues to fix the problem. That earns her a visit from Luke McAllister, Afire’s chief security officer. Luke is handsome and rugged and everything that Kylie likes in a man, but she soon finds that he is blaming her for the security breach. Before long, the two are on a collision course, but also secretly looking at more than each other’s digital footprints. When a fluke accident sends Kylie to the emergency room, Luke fears that the beautiful developer is in danger beyond the online world. Little does he know that she is also hiding a secret that threatens to jeopardize their now sizzling relationship. 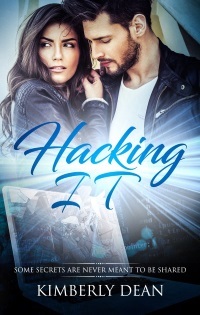 Can Kylie fix Afire’s problems without falling victim to the hacker? And can Luke learn to trust her and keep her safe before their enemy strikes again?